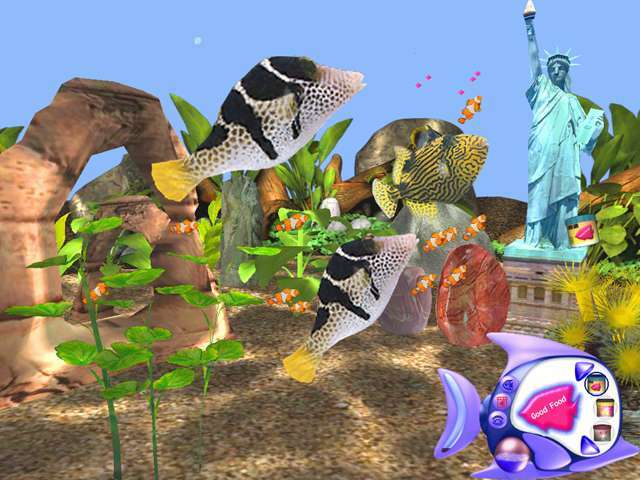 The emphasis of designing Aquarium Game is to create a relaxing atmosphere filled with astonishing virtual images for everyone in the family to enjoy. We provide you the virtual aquarium for you to set up, design, decorate and even allow you to choose your own occupants from a variety of more than forty-eight species. This is where you can relax yourself by watching the fishes swim through the seaweeds and anemones. You can move the cursor to the edges of the screen to rotate the point of view. You can even zoom in and out by pressing the [PageUp] and [PageDown] key respectively. 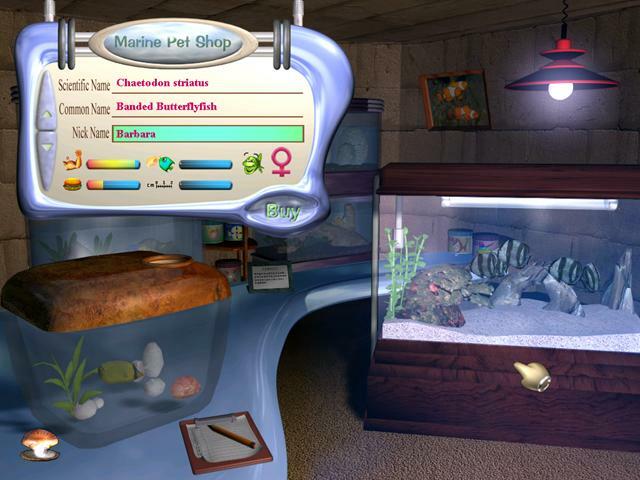 You can always go to the Marine Pet Shop to purchase new fish, or sell your fish back to the store. All your new pets purchased from the shop start off as fries. They can grow up to three times their usual fry size. These are not normal foods for they will create special effects on the fish. They are both entertaining for both you and the fishes. However, some of them may dislike the pizza after a few bites. Perhaps, increasing their intimacy level by tickling them with finger cursor will gain back their interest in pizza. Try it out, but pizza is not their primary food and hence does not feed them well. If you have taken good care of your fishes, they may begin to breed as soon as they reach maturity. Your aquarium is like a novelty stage, providing suitable acting quarters for your fishes. However, you may wish to decorate it up a bit to entertain both you and your fishes. You can always come here to construct a new tank, or to modify old tanks. Tropical Fish Encyclopedia records information on one hundred and three different species to help you learn about your fishes. 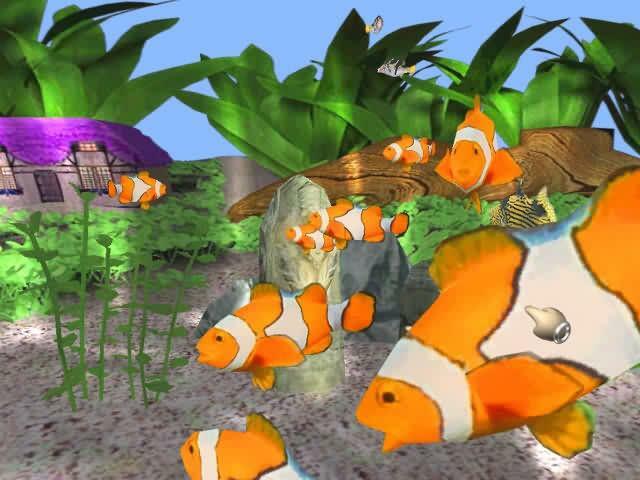 NOTE: We have nailed down the file size of VR Aquarium Game to 113MB, but it's still a six hours download for 56K modem users. P.S. You might use download manager such as GetRight, Download Accelerator, Netants, FlashGet, to help you download this fantastic software. Insaniquarium Deluxe Game - Feed fish, fight aliens, upgrade your weapons, and unlock secret pets, Insaniquarium Deluxe is a insane aquarium game for you! 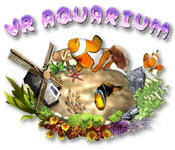 Aqua 3D Screensaver - Watch an aquarium on your desktop, a wonderful Aqua 3D Aquarium Screensaver for you! QuickSnooker - Snooker games and Snooker Pool Game for your Windows desktop!